You adore your dog, so why not give him the absolute biggest life possible? Fuel your dog's wag by feeding him a high-quality diet, going on lots of fun adventures with him and spending as much time as you can together. After all, his whole life is centered on you, fun and — of course — yummy food. Read on to discover how to keep your dog's wag the biggest it can be. "Healthy food" covers a broad spectrum when it comes to pet food. If you want the best life for your dog, choose healthy food with high-quality ingredients. For example, different dog foods contain different types of protein. You may have to try multiple types of protein to find the best fit for your dog. There are meat-based proteins like poultry, beef, fish, eggs, venison and lamb, as well as vegetarian recipes. Antioxidant-rich veggies and omega-3 fatty acids are also important dog food ingredients. These nutrients help support brain and muscle development and help support a shiny and soft coat. If your pup's body is in great shape, he'll feel his best. And if your dog feels good, he'll be bursting with happiness. Match your dog to the best recipe. You already knew your dog was special in so many ways, but did you also know that many dogs have special dietary needs? Find the right solution for your best friend. Some dogs do better on a grain-free diet, and while some dogs need food with alternative proteins like venison or a vegetarian recipe. Fortunately, there are as many food options out there as there are special doggie needs, like Nature's Recipe's® Grain Free Recipes, as well as formulas to support digestion. Travel with your canine companion. Studies have shown that nothing makes your four-legged friend happier than spending time with you. There's something even better about spending time together in a new, special environment, like on a trip! Traveling with your pooch gives you the chance to spend some quality time bonding with your dog while you're away from the hustle and bustle of everyday life. It also exposes her to lots of new sights, sounds and smells that stimulate her mind. Taking your dog along for your next camping trip or weekend getaway will be an experience neither of you forget — and it's a great way to fuel her wag. Go on everyday adventures with Rover. Speaking of how much dogs love adventure and routines, make fun a part of your regular schedule. Dogs need exercise and spending dedicated time with your dog every day is great for pet parents too. Scientific studies have shown that exercise actually increases the amount of endorphins your dog's body produces. These chemicals lead to feelings of happiness. Plus, making the commitment to be active with your dog means you commit to being more active too, making it a win-win for both you and your pup's health. These regular adventures can be as simple as a trip to a local dog park or a day of running errands to dog-friendly establishments with you. After all that activity, dogs and their people will feel great on the inside, as well as appreciate the fun they had together. 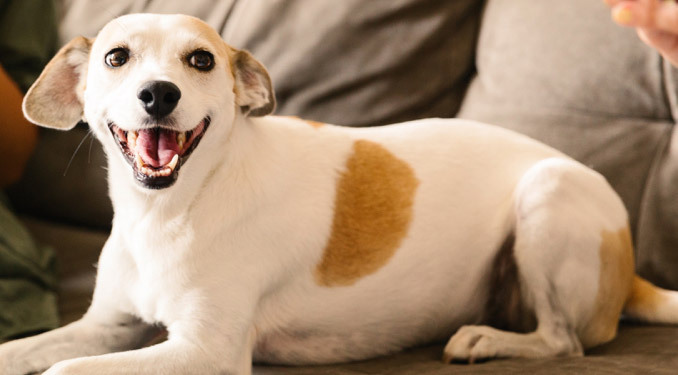 Want to keep your pup happy? Feed him the right Nature's Recipe® dog food that's designed for his age, dietary needs and size so that he gets the perfect balance of nutrition to fuel his wag to the fullest. Help! My Cat Is Stressed by New-Kitten Antics!